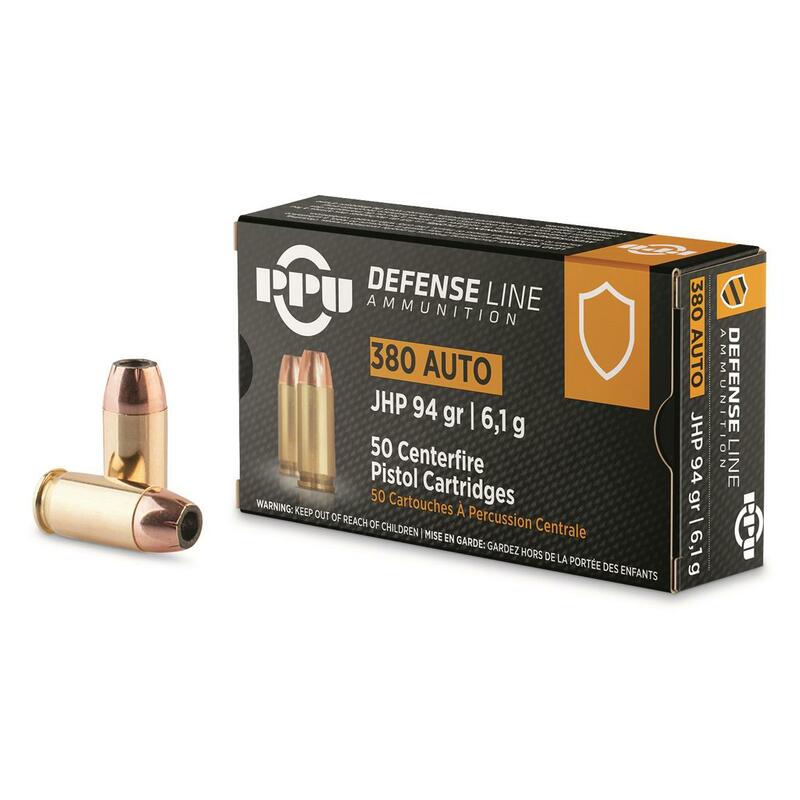 Introducing PPU®'s new duty/defense rounds. PPU Defensive Line, .380 ACP, JHP, 94 Grain, 50 Rounds is rated 4.8 out of 5 by 28. Rated 5 out of 5 by bobby from good deal as always.... it pays to check with the guide for the best deals in whatever I need. Rated 5 out of 5 by wils from Great fot storage stockpile Fine ammo for close-up self defense as secondary carry!! Rated 5 out of 5 by oldershootist from Usable accuracy from Ruger LCP2 and TCP Out of Ruger LCP2 and Taurus TCP very acceptable accuracy, (My "acceptable accuracy" definition; with cone of dispersion applied, at 40 feet I would hit a medium / small pumpkin 100% of the time). You must roll your own to exceed the accuracy I am getting with these. To be fair and accurate here of course "results may vary". Rated 5 out of 5 by Glenn N Fla from Great PRICE! Works well in all 380’s. Only one Hangup out of 200 rounds. Rated 5 out of 5 by YukonFan from Great quality ! Quality appears to be excellent and zero misfires. What more do you need? Rated 5 out of 5 by Headhunter 55 from Fed perfectly ! So far all the rounds fed good thru my Colt Gov handgun. Thats what I want !